This article is about the fictional noir pulp hero. For the Chicago bluesman, see Boston Blackie (guitarist). 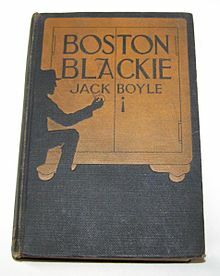 Boston Blackie is a fictional character created by author Jack Boyle (October 19, 1881 – October 1928). Blackie, a jewel thief and safecracker in Boyle's stories, became a detective in adaptations for films, radio and television—an "enemy to those who make him an enemy, friend to those who have no friend." Actor Chester Morris was the best-known Blackie, playing the character in 14 Columbia Pictures films (1941–1949) and in a 1944 NBC radio series. Boston Blackie is the role for which Morris is best remembered. Writer Jack Boyle grew up in Chicago, Illinois. 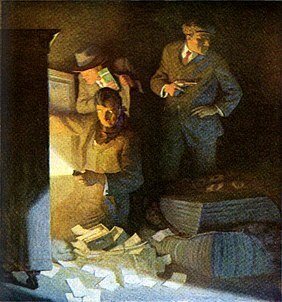 While working as a newspaper reporter in San Francisco, he became an opium addict, was drawn into crime, and was jailed for writing bad checks. Later convicted of robbery, Boyle was serving a term in San Quentin when he created the character of Boston Blackie. :149 The first four stories appeared in The American Magazine in 1914, with Boyle writing under the pen name "No. 6066". From 1917 to 1919, Boston Blackie stories appeared in The Red Book magazine, and from 1918 they were adapted for motion pictures. The earliest Boston Blackie film adaptations were silent, dating from 1918 to 1927. Columbia Pictures revived the property in 1941 with Meet Boston Blackie, a fast, 58-minute B movie starring Chester Morris. Although the running time was brief, Columbia gave the picture good production values and an imaginative director, Robert Florey. The film was successful, and a series followed. In the Columbia features, Boston Blackie is a reformed jewel thief who is always suspected when a daring crime is committed. In order to clear himself, he investigates personally and brings the actual culprit to justice, sometimes using disguises. An undercurrent of comedy runs throughout the action/detective series. In one of these films, After Midnight with Boston Blackie, the character's real name was revealed to be Horatio Black. Morris gave the Blackie character his own personal charm: he could be light and flippant or stern and dangerous, as the situation demanded. His sidekick, the Runt, was always on hand to help his old friend. George E. Stone played Runt in all but the first and last films. Charles Wagenheim and Sid Tomack, respectively, substituted for Stone when he was not available. Blackie's friendly adversaries were Inspector Farraday[a] of the police (played in all the films and the radio series by Richard Lane) and his assistant, Sergeant Matthews. Matthews was originally played as a hapless victim of circumstance by Walter Sande; he was replaced by Lyle Latell, who played it dumber, and then by comedian Frank Sully, who played it even dumber. Blackie and Runt were often assisted in their endeavors by their friends: the cheerful but easily flustered millionaire Arthur Manleder (almost always played by Lloyd Corrigan; Harry Hayden and Harrison Greene each played the role once), and the streetwise pawnbroker Jumbo Madigan (played by Cy Kendall or Joseph Crehan). A variety of actresses including Rochelle Hudson, Harriet Hilliard, Adele Mara and Ann Savage took turns playing various gal-Friday characters. The films are highly typical of Columbia's B movies of the 1940s, with an assortment of veteran character actors (including Clarence Muse, Marvin Miller, George Lloyd, Byron Foulger), new faces on the way up (Larry Parks, Dorothy Malone, Nina Foch, Forrest Tucker, Lloyd Bridges) and stock-company players familiar from Columbia's features, serials, and short subjects (Kenneth MacDonald, George McKay, Eddie Laughton, John Tyrrell). The series was also a useful training ground for promising directors, including Edward Dmytryk, Oscar Boetticher, William Castle, and finally Seymour Friedman, who went on to work prolifically in Columbia's television department. The Boston Blackie series ran until 1949. 1919 The Silk Lined Burglar Sam De Grasse Adapted from "Miss Doris, Safe-Cracker"
1919 Blackie's Redemption Bert Lytell Adapted from "Boston Blackie's Mary" and "Fred the Count"
1922 Missing Millions David Powell Adapted from "A Problem in Grand Larceny" and "An Answer in Grand Larceny"
1923 Boston Blackie William Russell Adapted from "The Water-Cross"
1923 Crooked Alley Thomas Carrigan Adapted from Boyle's original story, "The Daughter of Crooked Alley"
1924 Through the Dark Forrest Stanley Adapted from "The Daughter of Mother McGinn"
Boston Blackie—enemy to those who make him an enemy, friend to those who have no friend. Concurrent with the Columbia Pictures films, a Boston Blackie radio series—also starring Chester Morris—aired on NBC June 23 – September 15, 1944, as a summer replacement for Amos 'n' Andy. Lesley Woods played Blackie's girlfriend Mary Wesley; Richard Lane played Inspector Farraday. Harlow Wilcox was the announcer for the 30-minute program. A new incarnation of the Boston Blackie radio series aired April 11, 1945 – October 25, 1950, starring Richard Kollmar. Maurice Tarplin played Inspector Farraday; Jan Miner was Mary. More than 200 half-hour episodes were transcribed and syndicated by Frederick Ziv to Mutual and other network outlets. Kent Taylor starred in the Ziv-produced half-hour TV series The Adventures of Boston Blackie. Syndicated in September 1951, it ran for 58 episodes, lasting until 1953, continuing in repeats over the following decade. Lois Collier appeared as Mary Wesley and Frank Orth was Inspector Farraday. The series was set in Los Angeles; Mary and Blackie had a dog named Whitie, and comedy sometimes took precedence over crime. Television historian Tim Brooks described Boston Blackie as "a memorable B-grade television series … The term 'B' is used in all the best senses: a certain vitality and sense of humor substituted more than adequately for the normal criteria of expensive production and famous stars." Scripter Stefan Petrucha and artist Kirk Van Wormer created the graphic novel Boston Blackie (Moonstone Books, 2002) with a cover by Tim Seelig. A jewel heist at a costume ball goes horribly wrong, and the five-year-old son of the wealthy Greene family disappears and is presumed dead; the body is never found. The main suspect is Boston Blackie, who is still haunted seven years later by what happened that night. Drawn back into the case, he finds that the truth of what happened that night is awash in a watery grave. A sequel to the graphic novel was published years later. A 1957 Daffy Duck cartoon, Boston Quackie, is a direct parody of the serial, with Daffy as the detective - who needs everyone else's help to solve his case. Jimmy Buffett's song "Pencil Thin Mustache" references Boston Blackie, as does The Coasters' song "Searchin'" and some versions of "The Wabash Cannonball". Boston Blackie's Restaurant was a bar and grill with locations in Chicago and Deerfield, Illinois. In a 1967 episode of Bewitched ("Samantha's Thanksgiving to Remember", Season 4, Episode 12), "Boston Blackie" is mentioned in fond remembrance by Aunt Clara (Marion Lorne), who confuses him as attending the First Thanksgiving with famous Pilgrims. In Errol Morris' 1988 documentary "The Thin Blue Line", interview subject Emily Miller cites Boston Blackie as an inspiration for wanting to become a "detective, or the wife of a detective." The film's score by Philip Glass also has a cue titled "Boston Blackie." "I'm just like Boston Blackie, Yes I am, Yes I am"
"Friends to those who have no friends"
In a 2007 television episode of Mad Men, when talking about John F. Kennedy as a potential opponent for 1960 presidential candidate Richard M. Nixon, character Bert Cooper says, "It's going to be Kennedy. 'Boston Blackie' won West Virginia." ^ The surname of Boston Blackie's police adversary was spelled Faraday in only the first film, Meet Boston Blackie. In all subsequent films it was spelled Farraday. ^ a b Backer, Ron (2010). Mystery Movie Series of 1940s Hollywood. Jefferson, North Carolina, and London: McFarland & Company. ISBN 978-0-7864-4864-7. ^ Boyle, Jack (1919). Boston Blackie. New York: A. L. Burt. OCLC 11311055. ^ Boyle, Jack (July 1914). "The Price of Principle". The American Magazine. Retrieved 2016-08-27. ^ Boyle, Jack (August 1914). "The Story About Dad Morgan". The American Magazine. Retrieved 2016-08-27. ^ Boyle, Jack (September 1914). "Death Cell Visions". The American Magazine. Retrieved 2016-08-27. ^ Boyle, Jack (October 1914). "A Thief's Daughter". The American Magazine. Retrieved 2016-08-27. ^ a b c d e f g h i j k l m Contento, William G. "Boyle, Jack (1881–1928)". The FictionMags Index. Retrieved 2016-08-27. ^ Boyle, Jack (August 1918). "Miss Doris's "Raffles"". The Strand Magazine. Retrieved 2016-08-27. ^ Boyle, Jack (April 1919). "The Third Degree". The Strand Magazine. Retrieved 2016-08-27. ^ Boyle, Jack (June 1919). "The Daughter of Mother McGinn". Cosmopolitan. Retrieved 2016-08-27. ^ Boyle, Jack (July 1919). "Alias Prince Charming". Cosmopolitan. Retrieved 2016-08-27. ^ Boyle, Jack (October 1919). "Black Dan". Cosmopolitan. Retrieved 2016-08-27. ^ a b "Boston Blackie". AFI Catalog of Feature Films. American Film Institute. Retrieved 2016-08-26. ^ Boyle, Jack (November 1919). "The Water-Cross". Cosmopolitan. Retrieved 2016-08-27. ^ Boyle, Jack (March 1920). "Grandad's Girl". Cosmopolitan. Retrieved 2016-08-27. ^ a b "The Face in the Fog". AFI Catalog of Feature Films. American Film Institute. Retrieved 2016-08-26. ^ Boyle, Jack (May 1920). 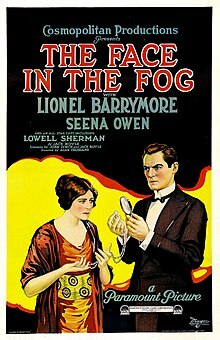 "The Face in the Fog". Cosmopolitan. Retrieved 2016-08-27. ^ Boyle, Jack (October 1920). "The Painted Child". Cosmopolitan. Retrieved 2016-08-27. ^ Boyle, Jack (December 1920). "Boomerang Bill". Cosmopolitan. Retrieved 2016-08-27. ^ "Boston Blackie's Little Pal". Progressive Silent Film List. Silent Era. Retrieved 2016-08-26. ^ a b "Meet Boston Blackie". AFI Catalog of Feature Films. American Film Institute. Retrieved 2016-08-26. ^ "Boston Blackie's Little Pal". AFI Catalog of Feature Films. American Film Institute. Retrieved 2016-08-26. ^ "The Poppy Girl's Husband". AFI Catalog of Feature Films. American Film Institute. Retrieved 2016-08-26. ^ "The Silk Lined Burglar". AFI Catalog of Feature Films. American Film Institute. Retrieved 2016-08-26. ^ "Blackie's Redemption". AFI Catalog of Feature Films. American Film Institute. Retrieved 2016-08-26. ^ "Boomerang Bill". AFI Catalog of Feature Films. American Film Institute. Retrieved 2016-08-26. ^ "Missing Millions". AFI Catalog of Feature Films. American Film Institute. Retrieved 2016-08-26. ^ "Crooked Alley". AFI Catalog of Feature Films. American Film Institute. Retrieved 2016-08-26. ^ "What Girardeau Theatres Offer". Southeast Missourian. December 29, 1923. Retrieved 2016-08-27. ^ "Through the Dark". AFI Catalog of Feature Films. American Film Institute. Retrieved 2016-08-26. ^ "The Return of Boston Blackie". AFI Catalog of Feature Films. American Film Institute. Retrieved 2016-08-26. ^ "Confessions of Boston Blackie". AFI Catalog of Feature Films. American Film Institute. Retrieved 2016-08-26. ^ "Alias Boston Blackie". AFI Catalog of Feature Films. American Film Institute. Retrieved 2016-08-26. ^ "Boston Blackie Goes Hollywood". AFI Catalog of Feature Films. American Film Institute. Retrieved 2016-08-26. ^ "After Midnight with Boston Blackie". AFI Catalog of Feature Films. American Film Institute. Retrieved 2016-08-26. ^ "The Chance of a Lifetime". AFI Catalog of Feature Films. American Film Institute. Retrieved 2016-08-26. ^ "One Mysterious Night". AFI Catalog of Feature Films. American Film Institute. Retrieved 2016-08-26. ^ "Boston Blackie Booked on Suspicion". AFI Catalog of Feature Films. American Film Institute. Retrieved 2016-08-26. ^ "A Close Call for Boston Blackie". AFI Catalog of Feature Films. American Film Institute. Retrieved 2016-08-26. ^ "The Phantom Thief". AFI Catalog of Feature Films. American Film Institute. Retrieved 2016-08-26. ^ "Boston Blackie's Rendezvous". AFI Catalog of Feature Films. American Film Institute. Retrieved 2016-08-26. ^ "Boston Blackie and the Law". AFI Catalog of Feature Films. American Film Institute. Retrieved 2016-08-26. ^ "Trapped by Boston Blackie". AFI Catalog of Feature Films. American Film Institute. Retrieved 2016-08-26. ^ "Boston Blackie's Chinese Venture". AFI Catalog of Feature Films. American Film Institute. Retrieved 2016-08-26. ^ a b c Dunning, John (1998). On the Air: The Encyclopedia of Old-Time Radio. New York: Oxford University Press. p. 110. ISBN 978-0-19-507678-3. ^ a b "Boston Blackie". RadioGOLDINdex. Retrieved 2016-08-28. ^ a b "Boston Blackie". Digital Deli Too. Retrieved 2016-08-28. ^ Dinan, John (Spring 2015). "Boston Illegal". Nostalgia Digest. 41 (2): 50–52. ^ a b Brooks, Tim; Marsh, Earle (1988). The Complete Directory to Prime Time Network and Cable TV Shows 1946–Present (4th ed.). New York: Ballantine Books. pp. 102–103. ISBN 0-345-35610-1. ^ Petrucha, Stefan; Van Wormer, Kirk (2002). Boston Blackie. Calumet City: Moonstone. ISBN 978-0972166805. Pitts, Michael R. Famous Movie Detectives. Scarecrow Press, 1979. ISBN 0-8108-1236-3. Wikimedia Commons has media related to Boston Blackie. Zoot Radio, free 'Boston Blackie' old time radio show downloads, over 390 episodes. Boston Blackie is playing at Outlaws Old Time Radio Corner.